Today’s Throwback Thursday is a tribute to Bob Ross and his ‘Happy Little Trees.’ Bob Ross had a magnetic, upbeat personality that came right out of the television and touched your heart. I watched his show many times, and my youngest son, in his pre-teen years, painted using Bob’s techniques a few times too. Many of Bob’s videos can still be viewed on YouTube. During these long winter days and snowed-in weekends, break out some old paints and try his technique. You might amaze yourself at what you can do. * Thanks to a comment on this post I can also add Netflix and Amazon Prime as two sources of Bob Ross Videos. Sepia is today’s Crayola color in Color Your World – 120 Days of Crayola. I have a few Sepia tones in this unfinished watercolor. 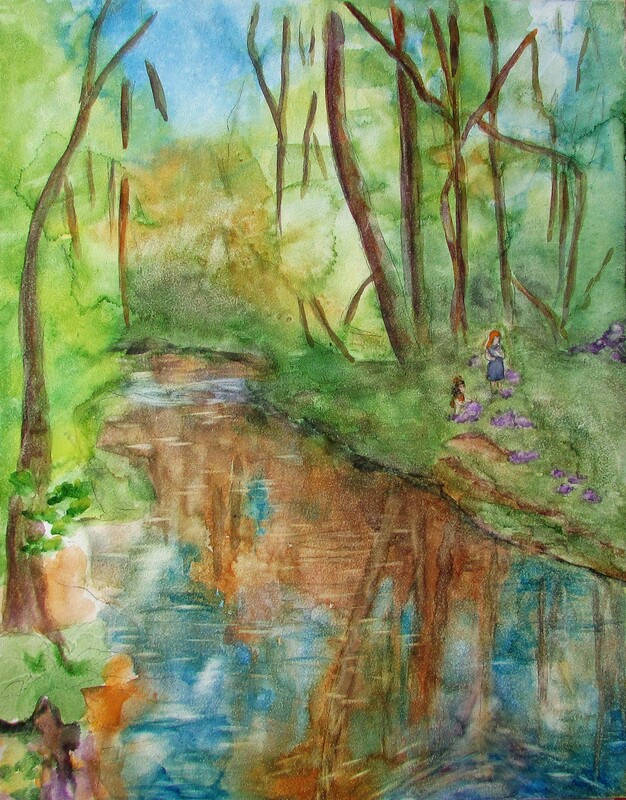 The watercolor, a painting of the creek that runs near my home, has been untouched for months. Why? This might sound strange, or perhaps you can totally relate, but I am so pleased with the form and colors to this point, I am terrified to touch it again in case I mess it up. This came about because the last thing I attempted to paint, or should I say, fix in the painting, was the reflections of the tree trunks in the water, and they gave me a devil of a time. Now, I am afraid to go back into it with my brushes because I don’t want to risk losing what I have done thus far. How silly you are probably saying, and I am saying it too. Perhaps this confession will lift the fear, I’ll laugh at myself and continue on. I wonder if this is why some paintings in museums tend to look not quite finished. Perhaps the artist was afraid he was going to mess it up if he continued. I’ll update…one of these days…when the painting is finished. Sigh…. What more do you want to add to the painting ? I think your painting is a work of art- from a person who cannot draw or paint for anything, I can truly admire any one who can paint. I am glad you are using God given talents instead of hiding them and also displaying them so others can share your joy. In the parable of the Talents- did Jesus mean – real money or talents or virtues ? I was wondering about this recently. I seem to have lost my line of thinking and need to get back to thinking again. Hi Susie, I know that the trees need some definition, and there are things in the foreground, such as the skunk cabbage plant in the bottom left, that could use a little defining too…but…I love it right now, and know that going back into it might remove some of the vibrancy. So, it is a dilemma. I really must do a little work in the front. I think I will wet the background and just drop a bit of the same color in some areas. Susie…now you are seeing into my how my thoughts spin round and round about this painting. I will post an update when I think it is finished. I found a whole series of Bob Ross shows on Netflix recently. Such fun. I remember watching him as a chi,d and marveling at how a beautiful painting was so quickly created all the while accompanied by a soothing soft voice of explanation..
I’m glad to have found him on YouTube. Although I paint in watercolors, at times I will try acrylics, and have a brand new set of water soluble oil paints sitting on a shelf that I have never touched. I don’t have Netflix, but maybe there are a few on Amazon Prime too. I’ll have to check it out. Yes, he is…I find his instructions soothing, but inspiring at the same time. Yes…I’m feeling that ‘must-paint soon’ mood beginning. Don’t laugh….my husband for years, listened to his videos to lull him to sleep. Christmas 2015 I had too many paint supplies for our granddaughter’s gift, so I wrapped some basic supplies up for my husband. One day he was bored and took them out. His first painting was shockingly good. We laugh at his sleep learning, but it seems that is what he did.